The cards will be available for all from 2012 but she said: "I regularly have people coming up to me and saying they don't want to wait that long." 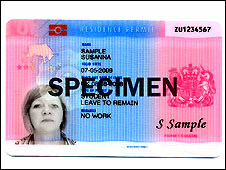 The home secretary made the claim as she unveiled revised ID scheme plans. Opposition parties say they would scrap the ID card scheme. The Tories call it a "complete waste of money". The Lib Dems call it a "laminated poll tax". They accused Ms Smith of backtracking on plans to issue ID cards in 2009 for all airside workers, by announcing they would pilot them at just two airports. The first biometric cards are being issued to students from outside the EU and marriage visa holders this month, and it had been planned to make them compulsory for all 200,000 airside workers from 2009. But instead the government announced there would be an 18-month trial, for airside workers at Manchester and London City airports only, from late next year. Campaigners No2ID said it was a "transparent attempt to save ministerial face" amid opposition from unions and airline bosses, who say it is unjustified and would not improve security. Unions had argued airside workers were already extensively vetted and believe they would have to pay £30 for a card - although it is understood they would be free during the trial period. Shadow home secretary Dominic Grieve described the decision to trial ID cards at just two airports as "clearly a climbdown" and "just a gimmick" aimed at selling the scheme to the public. But a Home Office spokesman said they had always said that "ID cards for critical workers would be starting in the second half of 2009 and we are on track to meet this commitment". He added ID cards would definitely be issued to the remaining airside workers in due course, before being rolled out to the wider population. In a speech to the Social Market Foundation Ms Smith said cards would be issued on a voluntary basis to young people from 2010 and for everyone else from 2012. She added: "But I believe there is a demand, now, for cards - and as I go round the country I regularly have people coming up to me and saying they don't want to wait that long. "I now want to put that to the test and find a way to allow those people who want a card sooner to be able to pre-register their interest as early as the first few months of next year." She told the BBC: "We'll see where that interest is, and then we'll see if we can issue some cards to those who've expressed an interest by the end of next year." People applying for cards and passports from 2012 will have to provide fingerprints, photographs and a signature, which Ms Smith believes will create a market worth about £200m a year. And in changes to earlier plans the Home Office is talking to retailers and the Post Office about setting up booths to gather biometric data. The government believes it would be "more convenient" for people and cheaper than setting up its previously planned enrolment centres in large population centres. In her speech Ms Smith rejected claims handing enrolment over to private firms would compromise security. "Provided that it is conducted in a secure and trusted environment, by service providers accredited and verified by the IPS and to high and rigorously enforced standards, enrolment should be able to happen at the convenience of the customer - on the high street, at the nearest post office, or at the local shopping centre." The overall cost of the ID card scheme over the next 10 years has risen by £50m to £5.1bn in the past six months, according to the government's latest cost report. "She must be ignoring twice the number of people who are coming up to her and saying I don't want my details on any database whatsoever," said Mr Booth. 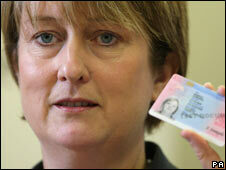 He said the government would struggle to find private firms willing to bid for the ID card contract. "What company is going embarrass itself to the tune of millions for a contract that everyone outside the Home Office itself knows will be cancelled by a new administration?" he said. For the Conservatives Mr Grieve said his party would axe the whole scheme because it was "a complete waste of money" and had asked for "break clauses" to be inserted into government contracts so it could be ended "without massive cost and waste to the public purse". The government's plan to involve retailers in enrolling people was "worrying" given the government's IT track record, he added. Lib Dem home affairs spokesman Chris Huhne said: "Ministers are choosing a limited number of guinea pigs at two smaller airports because they are aware of how unpopular ID cards are. "The government is too scared to force ID cards on voters before an election because they know it would be a laminated poll tax. "The problem is not the ease with which we can give up sensitive personal data, but the ease with which the Home Office loses it. The Government cannot be trusted to keep personal information safe."